4Media Xbox Converter for Windows, the best Xbox/Xbox 360 movie converter, can convert nearly all types of video files including MPEG, WMV, MOV, MP4, RM, RMVB, DivX, ASF, VOB, 3GP, FLV, AVI to Xbox/Xbox 360 movies, especially HD. 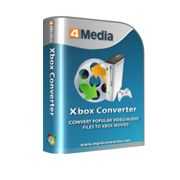 4Media Xbox Converter helps you convert almost all popular video/movie formats to Xbox MP4, AVI, VOB, ASF, WMV formats. All these output videos can be played on your Xbox. The Xbox 360 movie converter can convert MPEG, WMV, MOV, MP4, RM, RMVB, DivX, ASF, VOB, 3GP, FLV as well as AVI to MP3 and convert between audios like MP3, WMA and WAV. The Xbox video converter also provides the easiest way to convert Xbox high-definition videos. With 4Media Xbox Converter, you can also directly convert video segment, split video file, freely adjust video and audio parameters, take a snapshot and preview your video. It will be cool to have this great Xbox 360 movie converter! 4Media Xbox Converter accepts the widest range of video formats: AVI, MPEG, WMV, MOV, MP4, RM, RMVB, DivX, ASF, VOB, 3GP, and FLV, and video output to Xbox compatible formats. Besides Xbox video converting software, the Xbox video converter can convert most audio formats to MP3, WMA and WAV. CD decoding is supported. Directly convert your videos to MP3, WMA and WAV audios with the Xbox 360 converter for enjoying background music via your Xbox. Multi-core CPU support means the video and audio conversion to Xbox is faster than ever before. Equipped with NVIDIA CUDA & AMD APP technology, converting speed acclerates to X5 faster speed. 4Media Xbox Converter helps you split video files into several Xbox video segments by customizing file size or time length. The Xbox 360 movie converter gives you the ability to define the start and duration of Xbox video segment you want to convert by yourself. Offers you classified output parameters to adjust: bit rate, sample rate, channels and so on in the Xbox video converter. The bitrate-calculated tool enables you to get desired-size video to convert and output by entering the file size in the tool. Batch conversion and multithreading mean the software converts multiple files one by one in a single step. It's time-saving. The video to Xbox movie conversion can be performed in the background for possessing less CPU space; it allows you to manage your system power. The built-in resizable player lets you preview video file before converting (allowing you to switch the zoom mode between 4:3 and 16:9). And you can take a snapshot of your loved video image when previewing. With just a few clicks, 4Media Xbox Converter will help you finish all video and audio conversion tasks with high quality and high speed.